No matter how long you have been teaching, there are still areas of instruction that can make you apprehensive. So what are those weak spots, and how do you deal with them? 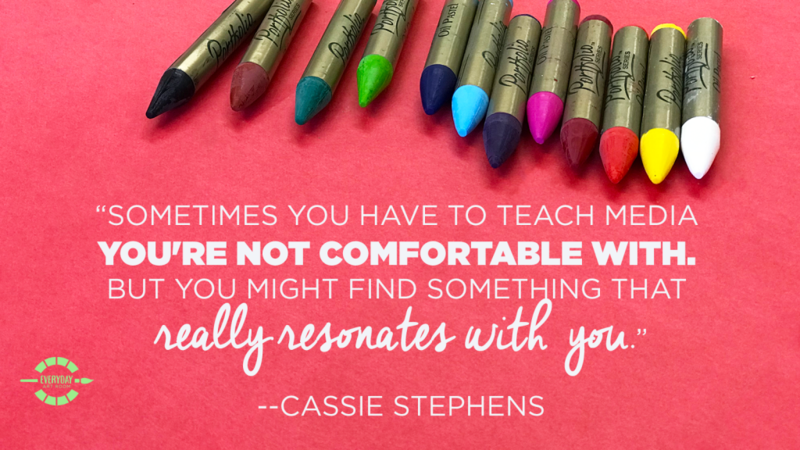 Join Cassie in this episode as she discusses teaching clay with no kiln or ceramics experience, dealing with the expectations of your colleagues, and how to begin teaching in areas outside of your comfort zone. Full episode transcript below. Cassie: 1998, when I made the move from Indiana to Nashville, and I started my very first art teachering gig, in that portable trailer, just to the left hand side of the school, I had a curriculum. I had a three ring binder for each of the grade levels that I taught, and at that time, it was just kindergarten through second. And in the three ring binder, it was purchased from some company, Spectrum Art I think is what it was called. And it had every lesson that I was supposed to teach. It shared all of the questions I was to ask my students. It showed an example of what their artwork was supposed to look like, and in the back of this three ring binder, this will date it just a bit, pinch, was a whole bunch of slides that I was to share with the kids. My favorite part about it was that every other week, or maybe it was every other two weeks, I was supposed to show my students one slide of one work of art and talk to them about that work of art for the entire hour of art class. Did I mention it was kindergarten through second grade? Yeah. So this curriculum already was written by somebody, just like all the curriculums on planet earth are. Somebody so far removed from the classroom that they’d completely forgotten what a five year old does when trapped in a dark room with a slide of that blue guitar, emaciated painting by Pablo Picasso. But that’s not what I’m trying to get to. I’m trying to say that there were a multitude of other crazy things in those three ring binders that I was expected to number one, know how to teach, and then number two, magically teach it. Let’s talk today about what scares you. 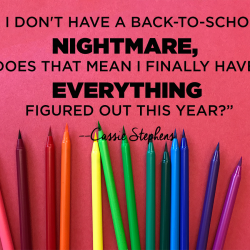 What do you find scary about teaching? And I’m not just talking about the kids. I mean the actual subject. Scary children, they’re always going to be there, and that’s probably a subject for another podcast. Today though, we’re talking about teaching those things that you aren’t familiar with. Clay, or weaving, or taking a giant mob of children on a field trip. Those things that scare you and how to get past that. I’m Cassie Stevens and this is Everyday Art Room. Okay so I have to share with you some other just little anecdotes of things that were in those three ring binders because as a person who, and I know I’ve shared this with you before, as a person who had done my student teaching with high school kids, and then got hired to teach elementary age children, and not like fourth and fifth grade, but we’re talking kindergarten through second, the littlest of the little. I was literally like a deer in headlights, as were they that very first day. They were looking at me, I was looking at them. I was just wondering who was going to make a first move, because my hands are sweating just thinking about it. I didn’t know who it was going to be. It wasn’t going to be me. So I was kind of thankful to have this curriculum, but also my mind was totally blown. And I remember flipping through the pages, because it didn’t tell me what order I had to teach these things in, at least I don’t recall. I mean, this is going 20 years ago. But I remember I was expected to teach clay. I never took a single clay class in college. I was always freaked out because everybody said you were going to have to learn how to make 2,598 pots on the potter’s wheel, and I was like, “Oh now, that’s not for me. I won’t ever need to know how to do that.” You know, like algebra. So here it was, clay, and I’m expected to teach it without a kiln. And I remember I went straight to the library. Remember those things? Those buildings that have books inside that you can borrow and then you take back if you feel like it, and if not, that they come after your paycheck? Well, I remember checking a book out and I remember the illustrations lead me to believe that this was a vintage book, it would probably catch high dollar on Etsy these days. And it said that the easiest clay recipe was a flour dough recipe. So I went to the dollar general, got me all the flour I could find mixed it up with some water. The next day, shared it with my students, and they had the best time playing with the stuff. They made easily the ugliest things you ever did see, but they had a blast and that’s all that mattered. I promised them that whatever they made, they would take home the next art class. I put it on a shelf and don’t you know, a couple of days later, when I went back, the projects that hadn’t dried up and cracked and fallen off the little boards that they had sculpted them on had turned gray, green, and fuzzy with mold. And I was mortified. I immediately threw everything away. I couldn’t have mold creeping around my portable. I mean, it was already gross enough as it was. Those kids, I swear it had to be like three years later, were still asking me if they could have those clay projects back. And I just didn’t have the heart to tell them what happened to them. So teaching clay was definitely something that was scary for me, something that I struggled with for years. And I’ll tell you how I got past that, but I’m not done telling my other tragic stories from that first year. Everything is just like it was yesterday. The other thing in that curriculum, weaving. I was supposed to teach paper loom weaving, one of my now favorite things to teach first grade. I was to teach that to my first graders my first year. And just as I got started talking about it, I’ll never forget this little dude named Jonathan, one of my best little artists in the class said, “Weaving is for girls.” And I literally had no response to that. Not having done any of my homework, I didn’t have a clue that I could have easily said, “But Kente cloth is this beautiful cloth from Africa that is only woven by guys.” It totally would have sparked his interest, but I had no clue. I got a C in my fibers class in college because when I was working my loom, I managed to skip a couple of strings when I was warping it, and I didn’t think it would matter, and it caused a huge runner to go all the way down my scarf, thus getting me a letter C.
Oh, and let me tell you, they also in this curriculum had that I was supposed to take all of the kids on field trips. And I took them to the Nashville art … Or, it was a art museum in Nashville at that time, it was the Nashville Performing Arts Center, which happened to have a Monet exhibit. I was taking first graders. I signed up to have all of them have Walkmans that they were to be able to operate and play us … A Walkman, you can’t fast forward through. Those of you babies who were born in the 2000s, let me just tell you, you can’t fast forward or just … Well, you can fast forward, just can’t click over to the next song or whatever like you can a CD. I was expected to have all these little first graders like fast forward on their Walkmans to get to the next little bit of information about the Money painting. Needless to say we scrapped them immediately and I just led all of my students on a guided tour myself. Those are all the tragic … Oh wait, I got one more. This is the worst. Kindergarten, collage, tissue paper collage. They had the best time when they were walking out with their creations and they were so excited, their little tissue paper squares stuck all over their paper. I remember the kindergarten teacher turning to me and saying, “Is this what they made today? This took them an hour?” And then turned on her heel and huffed off and I was mortified. So those things are all things that happened to me my very first year teaching. Teaching things that I didn’t have a clue, which at that time, I didn’t have a clue about anything, so everything was scary to me. And I managed to survive. And because I’m a fool, I’m still doing it 20 years later, without that much more of a clue. But all that to say is that sometimes we’ve got to teach the things we don’t know, and we’ve got to teach the things that scare us. I have throughout the course of my teaching career done the following. I have melted down a kiln. If you don’t know what that means, then let me just share with you a visual. I had placed all of my student’s clay projects in a kiln, and it was a manual kiln, meaning you actually had to put this little thing in there, it’s called a cone. When the cone gets hot enough, it melts. When it melts, a little lever drops, and that little lever shuts off the kiln. If you accidentally put a shelf in your kiln that bumps into the lever, thusly preventing it from dropping down, well then you’re going to melt down a kiln. And when you open the kiln, it’s going to look like melted marshmallows or melted ice cream all over the inside of your kiln, because what happened is the kiln got so hot it actually melted the clay. Did you know that was a thing? I surely did not. And I immediately had a panic attack and had to be sent home. I have also tye dyed yarn with my students, only to have all of the colors rinse right out of the yarn because I tye-dyed the yarn with acrylic yarn. If you’re ever going to tye dye or ice cube, Kool Aid ice cube dye, which is what I was doing yard, side note, make sure you use 100% wool yarn. I have also had students take weavings off their circle looms only to see their weavings just kind of crumble up into what looks like a wadded mess of yarn, like a rat’s nest. Actually, looked more like a colorful bird’s nest. I don’t … Do rats actually nest? Is that a thing? Anyway, these are the things that I have done. And those are not the things I did my first year of teaching. Those are the things I did long after my first year. And yet, despite all of those things, I have, despite having melted down a kiln in my lifetime, I’ve written a clay book filled with 52 clay projects. And despite having washed away all of the color from yarn that I tye dyed, I’ve managed to successfully tye dye thousands of T-shirts with my students for our school-wide event. And despite having made rat’s nest, or whatever you want to call it, out of circle loom weavings, I now teach fibers and it’s easily my most favorite thing to teach. So speaking of fibers, what I’m teaching right now are things like circle loom weaving, embroidery, sewing and boutique. None of these things I just have the knowledge base of. I wasn’t born knowing how to do these things. I had to learn. And that’s really what I want to stress to you today I that we’re going to be asked as art teachers, or we are asked as art teachers, or expected to know so many different techniques, to know how to tye dye, to know how to teach clay, to know how to teach things like boutique, all the fiber arts and all the drawing skills and so much. It’s kind of insane. And at some point you’re going to be expected to teach things that are beyond your knowledge base and beyond what you learned in college. How are you going to do that? Well that’s what I really want to chat with you about today. Because I think saying, “Well, I don’t know anything about fibers, so I’m just not going to teach it. And I don’t know too much about clay, so I’m going to like maybe not do that. Or I don’t know how to do stop animation.” I’m talking about myself here. “Or anything with iPad, so I’m not going to do that.” Yeah, I’m probably still not going to do that. But the other things, I have had to force myself how to learn because it’s … What’s going to happen is you might find something that is really going to resonate with you. For me, that’s fibers. And then you’re going to find students where that really resonates as well. So how do we learn these things that we were never taught in college, or maybe we’re not comfortable with teaching? Well, here’s what I would strongly recommend you do. Clay I feel like is everybody’s Achilles heel, unless you just happen to get like a masters or whatever in ceramics in college. For that, when I … After I melted down that kiln, I knew that I had to get help immediately. And one thing I did right away was I looked into community ed classes and I found a community clay class. From there, in that class, I learned about a wonderful woman who, if you’re in the Nashville area, or even if you’re not, you need to look her up. Danielle McDaniel, aka The Clay Lady. She is an angel sent from heaven and does an amazing job of teaching teachers how to teach clay. If you can’t get in a class with her because you’re not in the Nashville area, definitely Google The Clay Lady. She’s written several books and she is phenomenal. So finding a class is your best bet I feel like. I’ve taken a lot of sewing classes, definitely weaving classes have really, really helped me gain a knowledge base that I wouldn’t have otherwise had. Of course there are online classes. Who does online classes? Somebody that starts with an A, there’s an O in the middle, maybe an E at the end? Tim, this is your cue. Tim, this is your cue to promote some AOE online classes. Tim: Thank you to Cassie for that wonderful set up for this ad. If you are looking for a course that helps you to learn to teach ceramics even better than you do already, there is nothing more helpful than AOE’s studio ceramics course. Like all AOE studio courses, it is worth three credits. It runs for eight weeks and gives you both the hands-on techniques and the instructional strategies you need to make it work for your own classroom. If you’re looking for other media, AOE also offers courses in drawing, painting, fibers, printmaking, and sculpture. 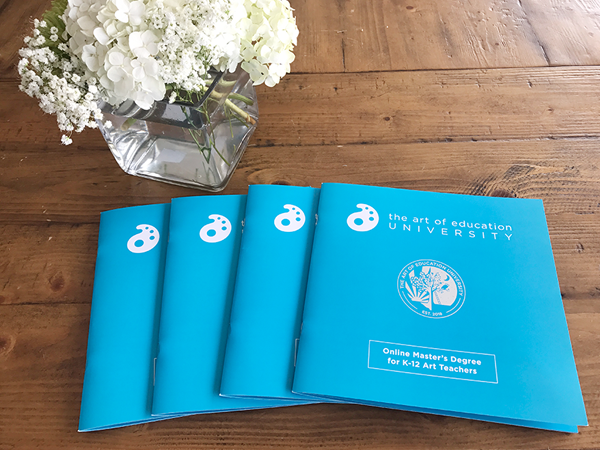 You can learn more about studio courses or any of the 20 plus courses offered at the ArtofEd.com/courses. Now let’s let Cassie continue on with the episode. Cassie: There are legit classes on anything. And then there’s that magical thing called YouTube where you can learn all sorts of things. 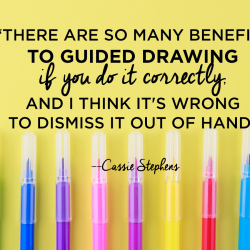 So I kind of feel like there’s no reason why you shouldn’t be teaching certain things, because there’s all these resources at your fingertips. All y’all teachers right now are so super spoiled, because when I started out way back in the late 90s, there was none of this stuff. So there was library books with antiquated clay recipes in them that just got moldy. Another thing, speaking of library books, that you could do, check out books in the library and one of my favorite, favorite things to do, which I haven’t done it in awhile because my house is a disaster, but one of my favorite things to do is to host craft nights. I love hosting craft nights at my house, where sometimes I’ll share a new craft that I’ve learned, but what I really love is when I ask my art teacher buddies to bring something that they want to share, and so they can show me and the rest of us, but mostly just me, how to do something new, especially if it’s a successful project that they’ve done in their rooms, in their classrooms or art rooms. And hosting a craft night is just so much fun anyway because you can have some adult bevies, a little bit of a relaxing time, do it on a Friday night or a Saturday evening when everybody’s just ready to unwind, have a great time, and just share. I also, in my school district, we also host PDs, professional developments, and I’m actually hosting one this coming Tuesday, and I’m going to share with them some weaving projects that I do with my students. If you have the opportunity to connect with other art teachers in your district, and you can do it and get your professional development hours, y’all that is where it’s at. Have everybody bring their most favorite lesson, maybe have a clay PD, and everybody bring their best clay project. Or a fibers PD. Or even like a landscape painting PD. Anything that you feel like you would like to get a little bit of help with, it’s always great to ask. And I love learning how other teachers approach these subjects, especially ones that I might struggle with. And of course, ask a friend. My buddy Debbie is the one who taught me how to sew. All those years ago, gosh it has to be going on maybe 10 or 12 years ago. I never knew how to sew from a pattern. I only knew how to kind of wing it. And I visited her and we spent the weekend sewing a dress from a 1950s pattern. And it all would have went great, but being that I had no clue about patterns, I remember we were nearly finished with the dress when she said, “Cassie, is this actually your size?” When I looked at the measurements, bust 29, waist 18, hips free, because it was a fit and flare dress. I was like, “Oh heck no, honey. That is not my size.” She was like, “Well then, Cassie, this dress is not going to fit you.” Then I learned the awesome way to improvise and to really kind of make something work, which is way before Project Runway even came along. So all that to say grab some friends, grab some library books, get on the internet, and teach yourself. Teach yourself those things that scare you. 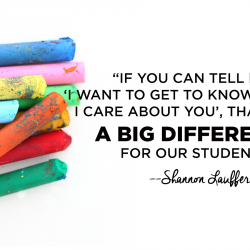 And once you learn, how much fun will it be to share what you’ve learned with your students? And then to learn along with them? Because what they can teach us is way more than what we could ever just learn from a book or from a class that we’ve taken ourselves. So I hope that that helps you get past the scariness, those things that you want to teach, but you’re a little bit afraid. Just sometimes when I have something like that that scares me, I imagine myself just plugging my nose and jumping in. And when you have those things that you are a little bit nervous to teach, give yourself that visual. I mean, what’s the worst that can happen? You scrap the lesson. You learn from it. You try something new the next time. Give it a shot, guys. Okay so in case you don’t know what a Friendly Loom is, that’s the brand name. It’s called Friendly Loom, and it is a giant standing loom. It probably stands, you can actually adjust the height. So it probably stands about four feet tall and it’s I think about three feet wide. And it has plastic pegs at the top and the bottom, and then you can warp the loom. I’ve had it for many years and it usually resides in my storage closet, I’m going to be honest. Last year, I decided to create a fibers area so that my early finishers could go over and work on the Friendly Loom. I warped the loom with just thick cotton string and I warped it in three separate sections. That will be taken off and thrown away because the pegs are close enough together that as the kids are weaving, it’s difficult for them to go over and under, it’s hard for them to see. So I recently had my friend Ashley, who owns a company called Black Sheep Goods, and she has a weaving company. You should check her out on Instagram. And she shared with me that I might want to warp the loom every other peg, that way the strings are spread a little bit further apart and the kids can see better when they’re weaving. When I have my students weave on the Friendly Loom, I don’t have them weave with yarn, simply because the loom is so big, it would take them forever to weave all the way to the top. So I snip fabric and tear it and have them do a rag weaving. To start the weaving, I put a piece of paper about four inches high and then the width of whatever I’ve warped it. I don’t plan on warping it all the way across. I plan, again, on warping it probably in two sections this time, spacing it two pegs apart. And they will be weaving with the rag fabric, or just the strips of fabric, weave one that’ll be as wide as the warp, meaning they don’t have to do the thing where they have to turn, because I’ve noticed when kids have to do a turn in weaving, they tend to do something called draw in, meaning they bring in the weaving. You know what I’m talking about, it kind of has that hourglass look. So she’s asking, “Do I section off for certain individuals?” Nah. I use this as like a early finisher center. And my kids really loved it because they could sit on either side of the loom and talk to each other as they were working. I have a couple of crates that I’ve put pillows on that they sit on while they’re working. And it’s just like a community project that they can go and work on whenever they have the chance. What will we do with the weavings when they’re finished? Well, we have never actually finished a weaving. For now, it’s just a good experience for them. So I’ll keep you posted. Maybe I’ll make some rag rugs for my house. Who knows? And I’ll say, ah-hem, and they all go, ah-hem. And then we start from there. They get it. They get it that fast. And I go through all of the directions. I introduce new vocabulary words this way, new processes, whatever. It’s basically any time I want them to retain something, or I notice that they’re fading a little bit because I’m jibber jabbering too much. I clear my throat and we get really animated and they repeat after me. I don’t have a signal for my kids to stop repeating after me. Because they have been with me long enough that they can usually tell by the change in my voice that they’re no longer needing to repeat after me, that they can switch it off. I have had a couple time where there’s the smart alecky dude who will just keep repeating. And I’ll just usually just shoot him a look or be like, “Really, dude?” And that usually gets him to stop. However, I recently saw that another teacher did it in a different way where she would say, “Mirrors on,” and that was her signal that the kids were to repeat after her and copy her, and then when she said, “Mirrors off,” that meant they were to stop. Seems pretty smart. So that’s another way to go about doing that. But really, for me, I just kind of change the tone of my voice. I have a lot of videos on my YouTube channel of me teaching my students and of me doing call and response with my students. And you might, if you watch those you might kind of see how I do it. I don’t have a way to just … I don’t say, “Stop,” I don’t have a way that I physically say stop. I just literally just change my voice. Totally didn’t answer that question. I just talked in one great big circle, which was amazing. Hey, if you have a question for me that I can answer in a great big circle, you should send it my way. You can find me at The Everyday Art Room at the ArtofEd.com. And now I’m going to share with you a story that’s completely unrelated to this week’s topic because it’s just so stinking cute. So last week, I was teaching my second-grade students, and I had a little guy walk up to me with his embroidery that he was working on. He was wearing a green shirt, pair of green shorts, green socks, and you guessed her, Chester, his shoes were also green. The burlap he was stitching on was green, and the yarn he was stitching with was, yes, say it with me, green. Verde. And I said to him, “Whoa, dude. Somebody is a big ol’ fan of green.” And he said, “I like green so much that even my underwear is green.” Oh my goodness, we all had a good giggle at that one. My favorite part was is that he’s so sweet and so innocent that he didn’t know that talking about one’s underwear is not usually a topic open for discussion, but we decided it was A-Okay with us. Y’all, thank you for joining me once again this week. Next week, we’re going to talk about why I think cauliflower is the devil’s vegetable. I mean, how can it be rice, and pizza crust, and also like a lily white version of broccoli? I’ve got my suspicions and my conspiracy theories. I hope you’ll join me. Talk to you guys soon. I am very stressed right now. I feel that my talent as an art teacher is to understand the individuality of my students. I especially love to teach my children who have special needs, whether it is a developmental disability or a challenging home life or even just a bad day. I enjoy giving them the opportunity to express themselves through their art. I love to spend individual time with a child who is hurting and offer that child a chance to vent. My art projects tend to be open ended because of this. I also love to encourage my students to collaborate. I am elated when children come up with a plan for a group project and work together to make it happen. This approach often is very process based and doesn’t always produce “pretty” or “cute” art that could grace the pages of Facebook or Pinterest. However, I’ve always gotten good reviews from my peers (except for a couple of art teacher peers who have a different philosophy) and from my administrators. In fact one of my administrators ( I am a traveling elementary art teacher) last year ranked me as high as she could and even said that other art teachers should observe my methods.